They say that truth is stranger than fiction! The commercial poaching of elephants and rhinos in Africa can no longer be blamed on the Far Eastern mafia! Are they involved? Yes! They have, for years, been purchasing ivory and rhino horn from Africa’s subsistence poachers but they are not the ones who pull the triggers. 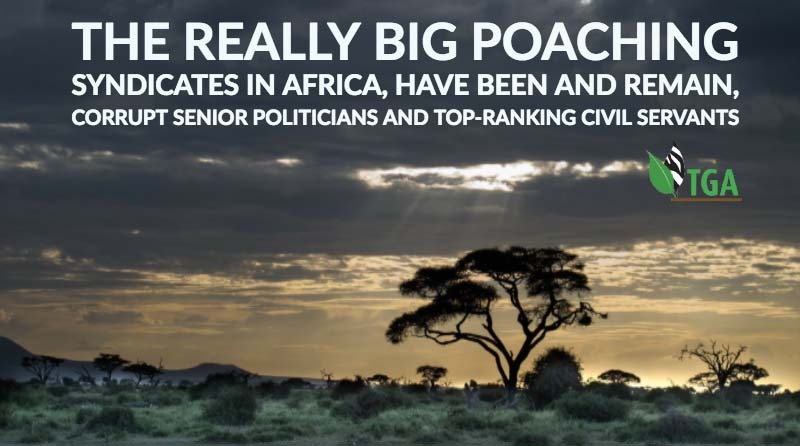 They have also not been the driving force behind Africa’s recent poaching pandemics - as the animal rightist propaganda purports. It would seem the world has been purposefully led astray. The people who have orchestrated the heavy poaching events since 1970 are Africa’s own political elite. They are the same people who dine with the Queen in Buckingham Palace! Africa’s traditional subsistence elephant poachers are the poverty-stricken rural peasants who live in close proximity to our national park boundaries. They are forever unemployed because there are no jobs in the remote regions of rural Africa, so they are easily persuaded to provide ivory and rhino horn to the poaching racketeers. Essentially they poach to survive. In this regard, I have great empathy with them! In some African countries elephant and rhino poachers are shot on sight. In others they are sent to gaol. The gaps their departures leave behind are, however, quickly filled by one of the millions of other poor rural souls who need the money. And the linchpins behind the scenes remain forever untouched. In recent years, more and more of Africa’s people - from all walks of life - are coming out of the woodwork to stress the fact that the most accomplished elements of the really big poaching syndicates in Africa, have been and remain, corrupt senior politicians and top-ranking civil servants. Ruling presidents and vice-presidents have been named as linchpins in the poaching syndicates in Kenya, Tanzania, Zambia and Zimbabwe. And fingers are currently being pointed at upper echelon politicians in Mozambique. In South Africa, the apparent inability of our Minister of the Environment to influence her counter-part in Mozambique - to stop the poaching of South Africa’s white rhinos in Kruger National Park by Mozambican nationals - is being cited as reason enough to suspect collusion of the most high and mighty in Southern Africa, too. It seems most likely, however, that the poaching of rhino on privately owned game ranches in South Africa is being orchestrated mostly by white South African citizens. Amongst those who have been cited, are ordinary criminals, ranch owners, veterinarians, ranch managers and/or their employees! Without their connivance the Far Eastern mafia would get no contraband! And the fact that, officially, 25 percent of all South Africans are unemployed is probably a major contributing factor. All this makes me wonder just how much of a red herring the widely publicized Vietnamese and Chinese poaching mafia has been. It seems that rather than being the instigators, they are just the buyers! Recently acquired information suggests that in some countries the military did at least some of the physical poaching - under orders from higher political authority. Sometimes the poaching is carried out by government game rangers - again under instructions from higher authority. Sometimes it is the traditional subsistence poachers who have pulled the triggers - under the protection of very senior people in government. All this puts another face on the commercial poaching saga in Africa. Soldiers and game rangers - we must never forget - are employed in their treasured government positions at the behest of the senior politicians who seem to have been orchestrating the poaching: and if these small fry open their mouths they will instantly lose their jobs (if not their lives). Being a whistle-blower in Africa, under these circumstances, is tantamount to committing suicide. In many countries, Africa is still a very dark continent! Sometimes people who just utter negative whispers about the government, or its political leaders, find themselves languishing in prison for a very long time. Or they simply disappear. Serious commercial elephant and black rhino poaching in Africa started in Kenya circa 1970. It happened during the presidency of Jomo Kenyatta - the founding father of the Kenyan nation. He is the father of the present Kenyan president, Uhuru Kenyatta. Jomo Kenyatta is said to have practiced an authoritarian style of government characterised by patronage, favouritism, tribalism and nepotism. This brought much criticism and dissent from the people that he ruled (1964 to 1978). During his tenure he had the constitution radically changed to expand his personal authority and to consolidate executive power. He encouraged the culture of wealth accumulation by his public officials; and to use that power to enhance the strength of their offices. This entrenched serious corruption within the Kenyan administration. After achieving the presidency, Kenyatta evicted many white settlers from their farms in the Rift Valley and surrounding highlands. One sixth of these properties were ostensibly reserved for the settlement of landless and land-hungry black Kenyans. They were, however, sold cheaply to the President and his wife, the First Lady Mama Ngina, as well as to his children. And, according to Kenya’s Truth, Justice and Reconciliation Commission, throughout his administration his relatives, friends and the senior officials in his administration, also benefited from this same vice with wanton impunity. In the 1950s and 1960s, Kenya was renowned for its wildlife plains-game spectacles and for its big game hunting safaris. During this era, many professional white hunters (hunting guides) attained almost mythical status. It was in Kenya that the safari - both hunting and photographic - was born! During the last century, large numbers of game viewing tourists visited Kenya on photographic safaris, and extensive areas of the country were set aside as national parks and/or game reserves to protect Kenya’s unique wildlife and wild places; and to accommodate these non-consumptive tourists. Today, wildlife has no value to the rural people of Kenya. The country’s rural economy is focussed on crop and domestic livestock production. The farmers, therefore, lose nothing and gain a whole lot more, by eliminating the game animals that compete - for grazing, browse and water - with their cattle, sheep and goats; and which sometimes spread disease to their domestic stock. Within the current administrative and land-use climate in Kenya, economically, the rural people are truly very much better off without their wildlife when their livelihood options are taken into account. Furthermore, when they have access to a black market for ivory and rhino horn, it pays them to poach elephants and rhinos, too. So Kenya’s wildlife seems doomed to total extinction - by default - sooner rather than later. The country’s once much vaunted ecotourism industry, therefore, will likely soon be in tatters. Kenya’s wildlife administration is, in great measure, in a sorry mess. In 1970 Kenya was said to be home to 275 000 elephants. By 1977 that huge number had been halved. By 1989 they had been reduced to just 20 000. That meant commercial poachers had killed more than 90 percent of Kenya’s elephants in less than 20 years. NB: During the period 1977 - 1993 an equally atrocious elephant slaughter had taken place in Tanzania (See Part II of this article). 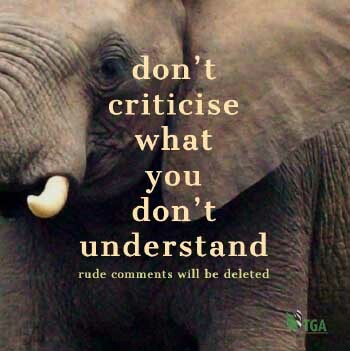 The accredited animal rightist NGOs at CITES, in1989, claimed that the whole of Africa had had 1.2 million elephants in 1970, and that this number had been reduced to less than 500 000 by 1989. These figures, however, were fabricated! They attributed the poaching to the fact that CITES allowed the sale of legally procured ivory. Their stated assumption was that illegal elephant tusks, derived from the above mentioned poaching, had been marketed internationally (laundered) through this CITES loophole. They further stated that the poaching was carried out in collaboration with a huge Far Eastern poaching mafia, by what they called “the greedy rural people of Africa” - especially those in Kenya and Tanzania. The NGOs were so charismatic in their assertions during the CITES debates, and so forceful in their demands, that they persuaded the official CITES delegates to vote in favour of imposing a universal international ban on the trade in ivory. They also had the elephant placed on the CITES Appendix I list which declared it to be an endangered species. And that is how the rot set in! Here is an abridged version of a very fine article on this subject, posted on the internet by Ma Vulture on March 12, 2012. It is entitled: ‘Mother of the nation who led plunder of beloved motherland’. It tells the whole story very clearly; and it corroborates several verbal and written reports that I have had from many Kenyans. Mama Ngina, as many Kenyans affectionately called their First Lady in the 1960s and 1970s - wife of President Jomo Kenyatta - has a public image that radiates calm and dignity. When visiting her husband’s mausoleum every August, Ngina Kenyatta is always resplendent in colourful African fabrics and matching headgear, and she cultivates the image of loss and courage, the epitome of pain and sacrifice. This mystique, however, is only a facade. The real Mama Ngina is a powerful business operator whose aggressive pursuit of money at the height of Kenyatta’s power saw her rise to become the richest woman in Africa. That should not be surprising, however, for wealth runs in the family, with her son, Uhuru Kenyata, ranked by Forbes Magazine as the richest man in Kenya, and the 23rd most wealthy man on the continent, on account of the enormous land holdings that he stands to inherit. Mama Ngina’s claim to fame in the 1970’s, however, is unique. Multiple but reliable international media outlets in the 1970s alleged her enormous wealth as stemming from elephant poaching and ivory smuggling that almost wiped out elephants from the face of Kenya. Charles Hornsby in his book ‘Kenya: A history since independence (1963 - 2011)’, explains how well connected cartels smuggled several kinds of game trophy contraband to Asian countries, to mint millions of US dollars. The ivory and skins recovered from the butchered animals were smuggled into Hong Kong, Japan and China where there was an insatiable demand. He records that at least 15 000 elephants were killed each year (during the 1970s and 1980s) whilst 10 000 black rhinos were shot dead between 1973 and 1979. Senior government officials, especially close members of the Kenyatta family, were involved in the poaching activities; and government vehicles were used to ferry the game trophies from the wildlife sanctuaries to East African coastal depots from where they were shipped directly to international Far Eastern markets. Legal procedures were ignored and the goods were exported without any legal papers. Mama Ngina was cited as being the chief butcher although she did not personally pull the triggers or unleash a poisoned arrow on elephants. She was, nevertheless, the matron who protected, controlled and paid those who did. Mama Ngina ignored the grumblings in Kenya’s parliament and she, together with Kenyatta’s daughter from a previous marriage, Margaret Wambi - who served as Nairobi’s first female African mayor - got away scot-free with their continuous plunder of Kenya’s wildlife. The whole Kenyatta family, it seems, was implicated in the poaching of elephants, rhinos and other wildlife, and in the export of the ivory, horns and skins, without papers. It was not only elephant that were killed. Five thousand zebra were shot within 500 kms (c.320 miles) of Nairobi in a six months long shooting spree in 1975. Two poachers were arrested in 1975 in possession of 26 000 beautiful Colobus Monkey skins but were released after they produced so-called valid permits. The Minister of Tourism, Juxon Shako, banned the killing of animals for their trophies - which was totally ignored because the poachers just bribed the police. Ironically, most of the hunting was conducted by Ministry of Tourism and Wildlife Service personnel. During this era, an expatriot official identified two assistant government ministers - including the then Nyandarua MP, Mr. ‘JM’ Kariuki - as amongst those who had been buying ivory cheaply direct from the game department headquarters for export. In 1973 the sport hunting of elephants was totally outlawed by the then Chief Game Warden, John Mutinda. It is alleged he was pressurised into doing this by both Mama Ngina and the animal rightist NGOs who were based in Nairobi. All hunting was eventually permanently banned in Kenya in 1977 - at the sole instigation, this time, of Ngina Kenyatta. This was the only way she could finally get rid of the only real opposition she had had to her poaching activities - because that action destroyed the fraternity of white professional hunters who were regularly reporting to the press on the severity of the poaching. Once that club of white opposition had been disbanded she had an open field to play in. There was no responsible management explanation ever given for the hunting closure! So the purpose of the hunting ban was never explained; and it was never discussed. NB. Following the closure of hunting in Kenya in 1977 it has been variously estimated that Kenya has lost more than 80% of its wildlife. The New Scientist magazine alleged that Jomo Kenyatta was personally involved in the poaching and the illegal trade, as was his wife and his nephew, Ngengi Muigai; the then Attorney General Charles Njonjo; and a former government minister, Paul Ngei. From being formerly involved in the poaching rackets, MP ‘JM’ Kariuki changed ships and joined a conservationist (animal rights?) lobby led by hotelier, Jack Block; and he began pestering Kenyatta in parliament to stop the poaching and the illegal trade in wildlife products. JM was murdered in 1975 and there was much speculation as to just how much Jomo Kenyatta, himself, had been involved in that event. A government minister and Kenyatta ally, Bruce Mackenzie - who was later exposed as a British plant and spy - would later tell the British High Commission that Mbiyu Koinange, an ivory racketeer and a close Kenyatta associate, was involved in JM’s killing. In August 1975, the London-based Sunday Times exposed the alleged greed of the Kenyatta family in a series of articles that, inter alia, detailed the family’s involvement in illegal ivory exports. It also detailed how Kenyatta personally approved the purchase of large farms by his family, exempting them from review by the Land Control Board. The newspaper identified some farms the family had acquired in the Rift Valley, including six owned by Kenyatta himself, a 26 000 acre property owned by Mama Ngina in Kiambu, and her several farms in Rongai next to others belonging to Kenyatta. According to the Sunday Times, Mama Ngina had been buying land at the coast where she built two hotels; whilst Mzee (Jomo Kenyatta) built the Leopard Beach Hotel for himself - which was registered under a Swiss company name. A local Kenyan newspaper revealed that, in 1972, the Mombasa Municipal Council had waived all rates on properties owned by the president and his family, and had listed a further 11 more in the area. The paper also described how the family operated through overseas front men such as George Criticos and Asian lawyers and accountants. The Kenyattas were reported, also, to have vested interests in international casinos. In 1967 a company for Italian investors, linked to the Italian mafia, established the Nairobi International Casino with Fred Kubai (and later Peter Muigai Kenyatta) and James Gichuru as shareholders. Whilst Kenyatta’s name did not appear on the registration papers, he owned the site and the building, and he received a third of its profits. After JMs murder, poaching continued unabated, motivating the Wilmington Star News (USA) (2 March 1977) to issue a warning that the world’s last wildlife herds in Kenya were facing extinction. According to the newspaper, the poachers were organised and they used bows and poisoned arrows, poisoned darts, muzzle-loaders and machine guns whilst enjoying protection from ‘the highest authority in the land’. Within the preceding six months prior to the publication of this story, it is alleged that 16 000 elephants, 135 black rhinos and 20 leopards had been killed by the Kenyatta-linked poachers. It has been calculated that Mama Ngina and her close Kenyatta relatives, were earning US$ 10 million a year from their wildlife poaching activities, throughout the 1970s and 1980s. Jomo Kenyatta died in 1978 but Mama Ngina lives on. When Ngina and the First Family could not cope with the national and international condemnation any more, they issued a five page statement through the Kenya News Agency dismissing the poaching allegations. The lengthy report judged as false, any and all allegations that Ngina was involved in the poaching. It called the accusations blackmail and scandalous. Furthermore, it considered the figures of dwindled elephant stocks to be guesswork. The organised elephant poaching in Kenya did not stop when the 1970’s came to an end. It continued, at least, until the time of the CITES meeting in 1989. I am intrigued by the fact that a whole host of international animal rights NGOs had become ensconced in Kenya from about 1965 onwards. When ethnic cleansing was applied to the Kenya Wildlife Authority and all the white game wardens were replaced with back personnel who had no wildlife management experience, it was these NGOs who came to Kenya’s rescue. They offered their (dubious) wildlife management expertise to train the new incumbents, together with funding, to keep the wildlife service running - and all the offers were accepted with alacrity by the Kenyatta administration. From the end of the 1960s, these NGOs have gradually taken control of wildlife policy in the country, providing vast sums of money to keep the Kenyan Wildlife Service running - - on condition that no hunting or sustainable use programmes are entertained. The Kenyan Wildlife Service is, therefore, now these NGO’s puppet. My puzzlement, however, is this: Having implanted themselves for over two decades in Kenyan political affairs, prior to the 1989 CITES convention these NGOs must have known all about the elephant poaching that was orchestrated by Ngina Kenyatta in the 1970s and 1980s. So why did they not broach the subject during the CITES debates? Why did they continue to insist that the poaching in Kenya was caused by the country’s “greedy rural people”? And why did they persist in their insistence that it was a legal loophole at CITES - which allowed the international sale of legally acquired ivory - that was also allowing illegal ivory to be marketed through the convention. Stories about Ngina Kenyatta were all over local and international newspapers during that time, and on the lips of every Kenyan. So there is no way that these NGOs could have been ignorant of the facts. Let me answer that question myself. Their purpose in going to CITES in 1989 was to invoke a universal CITES ban on the international trade in ivory; and the placement of the African elephant on the CITES Appendix 1 list - making it a so called endangered species. Telling the truth would have rendered the achievement of both those objectives impossible. NB: Anyone wishing to verify the facts contained in this article should spend their time surfing the internet! It is all there. You just have to put the pieces together.